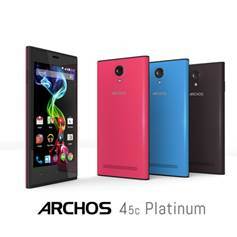 ARCHOS, a pioneer in Android™ devices, announces the availability of its new range of Platinum smartphones. The ARCHOS 45c Platinum and the ARCHOS 50b Platinum each come with three colourful back casings, the smoothness of Android KitKat®, amazing performance with their MediaTek quad-core processors and IPS screens from £99 and £119 respectively. Like their large IPS screens offering amazing colours and viewing angles, the three colourful back covers that come with the new ARCHOS Platinums will bring a bit of colour to autumn months. The interchangeable back covers are included in every box. In Deep Black, Metallic Blue and Spicy Pink they offset perfectly the deep black of the screen, obtained the full black lens lamination process. To as an added bonus, the ARCHOS 50b Platinum also comes with a see-through protective case and 8 GB micro-SD card in every box – the perfect back-to-school gift. Both Platinums have a 2MP front camera for better selfies and 5 and 8 MP back cameras with autofocus and flash. Able to record video in full 1080p HD, the ARCHOS 45c and 50b Platinums let users capture the colour of their lives in full definition. Along with their stylish design, the new ARCHOS Platinum smartphones have the power under the hood with their quad-core MediaTek processors and dual SIM placements. “ARCHOS’ latest colourful smartphones bring quad-core performance and the latest multimedia features to the style, utility and affordability conscious consumer. MediaTek is pleased to be powering ARCHOS’ latest Platinum devices,” said Siegmund Redl, MediaTek’s VP and GM of Corporate Marketing in Europe. 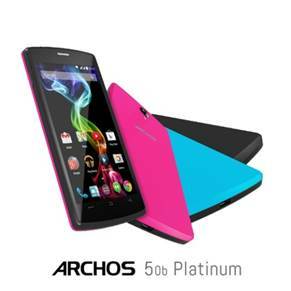 The ARCHOS 45c and 50b Platinum are available now from £99 and £119 respectively from www.archos.com and its usual retailers. For more information about ARCHOS’ entire selection of smartphones, tablets and connected objects, visit us at www.archos.com, Facebook and Twitter. The new range of ARCHOS Platinum smartphones as well as ARCHOS’ full range of other smartphones, tablets and connected objects will be on display at the ARCHOS stand at HKTDC from October 13th to 16th at booth 1A-F09.